Aisle O is the metaphorical location where all your output queues reside. Most likely, you've got output queues in several real locations (also known as libraries), but the beauty of the DB2 spool services is that they allow you access them however you need to—by library or across your entire system. Another one of my favorites is the DLTEXPSPLF command. If you're unfamiliar with the command, you may want to do a little Google searching. Who knows, maybe I'll write an updated article on it one of these days! But just so you know, the concept of this particular command is that you can assign "expiration dates" to spooled files. Typically, you would assign that expiration date at time of creation by assigning expiration parameters to the printer file, but you can also change the expiration date after the fact. Once you have an expiration date established, management is as easy as running a nightly job that runs DLTEXPSPLF to delete any expired spooled files. For a lot more information on managing spooled files and job resources in general, you may want to review the IBM Redpaper on the subject, available here. The DB2 services allow me to manage my spooled files in a way that's pretty intuitive to me. As an example, I can run a query to review all my output queues, and based on some sort of threshold, I can then further inquire into the actual spooled files for that output queue. Or, alternatively, I might want to list all the spooled files for a group of users (like those crazy folks over in accounting and their desire to keep trial balance information from the previous decade). WRKSPLF is good for a single user, but the spooled file services let me slice and dice that query for any number of users. It's pretty amazing. Such power, though, does not come without a price. Specifically, if I run a query using a broad scope, I may need to wait a while for my results. The services need to step through a lot of data in order to provide me with those more ambitious queries. This query creates a list of all the output queues with more than 1000 spooled files. Add the order clause ORDER BY NUMBER_OF_FILES DESC, and this list is sorted by number of files, with the most populated queues first. Using this, I can identify problem output queues and then drill down using the OUTPUT_QUEUE_ENTRIES service. This query gives you a list of users sorted by the number of spooled files each one owns and includes the timestamp when they last created one. When run on one of my systems, I found users who hadn't created a spooled file in over a year who had thousands of files on the system. Subsequent research showed that these were "historical" reports that they kept around "just in case." So we had not only all those extra spooled files, but also users on the system who had long since left the building but whose user profiles were still hanging around solely to keep those spooled files. Needless to say, these sorts of queries can be extremely useful when managing your spooled file population. A lot more issues need to be addressed, however, when it comes to spooled file management. For example, a big issue is the overall configuration and control of job logs. But hopefully this article introduces one effective tool that can help you in this endeavor. Joe Pluta is the founder and chief architect of Pluta Brothers Design, Inc. and has been extending the IBM midrange since the days of the IBM System/3. Joe uses WebSphere extensively, especially as the base for PSC/400, the only product that can move your legacy systems to the Web using simple green-screen commands. He has written several books, including E-Deployment: The Fastest Path to the Web, Eclipse: Step by Step, and WDSC: Step by Step. Joe performs onsite mentoring and speaks at user groups around the country. You can reach him at [email protected]. MC Press books written by Joe Pluta available now on the MC Press Bookstore. 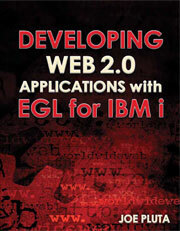 Joe Pluta introduces you to EGL Rich UI and IBM’s Rational Developer for the IBM i platform. Discover incredibly powerful WDSC with this easy-to-understand yet thorough introduction. Quickly get up to speed and productive using Eclipse.